1. What is implicit object request JSP? 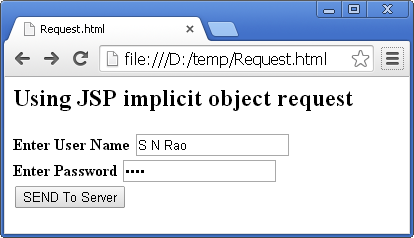 request is one of the 9 implicit objects, JSP supports. request is an object of javax.servlet.http.HttpServletRequest interface. Being implicit, it comes into existence (or created) automatically and the Programmer can use the object in his code without the necessity of creation. 2. With implicit object request JSP, what Programmer can do? Programmer can use request object to read HTML parameters sent by the client, to get cookies stored on client-side, header information and client system information etc. Programmer can set attributes with request object as key/value pairs. 3. What are the important methods of implicit object request JSP? The methods of request object are nothing but the methods of HttpServletRequest interface. Important are getParameter(String), getParameterNames(), getCookies(), getRemoteAddr(), getQueryString() etc. Following example uses a few methods of implicit object request JSP. HTML screen when some values are entered. Output screenshot of JSP file. getParameter("t1") returns the value entered by the user in HTML text box t1. The getParameterNames() is used to retrieve all the form fields at a time. The Enumeration object e contains all the form field names like t1 and t2. The nextElement() method of Enumeration returns the HTML field name as an object of Object class. This object is casted to String and assigned to fieldName. The getParameter(fieldName) returns the value or data entered by the user in string fieldName. The data is printed using out implicit object. User-Agent returns the browser used by the client. getQueryString() returns the name of the HTML field and the value entered by the user. getRemoteAddr() returns the client’s IP address. getRequestURI() returns the name of JSP file. getProtocol() returns the protocol used by client to send the request.